Puppies for sale from Yankee have a contract we both sign. Why? Because buying a dog can be tricky business. Horror stories abound. A contract that protects you. WOW! What a concept! The actual puppies available can be found on the puppies for sale page when you are ready. Why Include A Full Refund Guarantee? People often ask why I include the full refund guarantee with my dog contract. It’s because the purchase being made is of a living, breathing creature. Or a couple divorces and can’t decide who gets the Sheltie, so neither one ends up with it. And while I do my best to match a Sheltie to a buyer, there’s no guarantee it will be a perfect fit 100% of the time. That’s like asking me to stack marbles. The dog contract sets everything in writing should things not work out as planned when I have Shetland Sheepdog puppies for sale. I guarantee to give your purchase price money back if you aren’t happy with your Sheltie for any reason, at any time (as long as it is still alive). And if a buyer sees that he’s getting his money back simply for returning a Sheltie he doesn’t want, there will be fewer abused, neglected or abandoned animals. My Shelties always have a home here at Yankee. So all prospective buyers of my Shetland Sheepdog puppies for sale are required to sign a dog contract before they walk away. I believe if I am willing to breed, I should be willing to take responsibility for what I have produced… for life. This written contract helps to accomplish that. And remember, it protects you as well. Having things in writing is always best. You can thank the animal rights cultists for making the contract so lengthy. I now need to deliniate as much as I can imagine. Limited Registration meaning the dog is not for breeding. The name Yankee will preceed any name you want to use to register your dog. No re-selling my dog to others, no dumping in the shelter or giving to a rescue, friend or family member. If you don't want the dog, it comes back to me. If you have a friend that wants the dog they need to sign a contract with me first. If you bring the dog back alive with registration and microchip signed over to transfer back to me, you get a full purchase price refund minus any non-refundable deposit at any time during the dog's life. I will fine you $5,000 for not returning the dog to me if you decide you no longer want it. Same goes for breeding it without my consent. There are specific breeding contracts if you have that interest. I can only guarantee health of the dog when it is in my possession. Once I sell it to you, after 2 business days, I can no longer responsible for its health. I'll still take it back and you will still get your refund, regardless of the dog's condition but I can't guarantee that no matter what you do to the dog it will stay healthy. If you come back to me and say "the dog died, I want my money back", I need to see a completed necropsy report from a licensed vet and a return of the body to me (as proof it really died). I don't do business with anyone connected to the animal rights extremists groups such as HSUS, PeTA, HSVMA etc. I expect you to care for your dog as the companion animal it was sold as. While I'd like to think your sheltie would make a stellar agility competitor or therapy dog if that is what you are looking for, I can't guarantee what a puppy will mature into. If it doesn't turn out the way you want.... again... return the dog for a refund. You can always try with another dog. Anyone coming to my home to see puppies needs to sign a short statement verifying they are not visiting as an undercover animal rights fanatic looking to do me or my dogs harm and also give me a copy of their driver's license for security purposes. I must have this before you arrive. If you would like to get a copy of this Visitor Representation form, click this link. 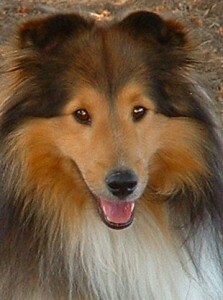 Having a Sheltie is not a necessity of life. It is a luxury item. If you don't have the required purchase price, then it would be best to return when you have the purchase price saved. If you can’t afford the purchase price of a purebred puppy, I can almost guarantee you won’t be able to afford the routine vet expenses. Let alone if s/he has an injury and requires surgery. Retrieving a pup for nonpayment is a difficult and emotional situation for both parties. I loathe the thought of taking a puppy away from a child because mom and dad didn’t pay for it. So, all shetland sheepdog puppies for sale are always for full payment. This can be via cash, check, credit card..